Let’s face it—when brainstorming ideal field trip locations for a group of blind or visually impaired visitors, a visual arts museum probably wouldn’t be at the top of your list. One might assume that art museums don’t have much to offer visitors with impaired vision. However, when vision teachers from the Dallas Independent School District reached out to the DMA to request a tour in 2014, we were eager to create an unforgettable experience for their students. Each summer, the DMA has welcomed this group of students, whom we work hard to impress—challenging ourselves to bring the collection to life through multi-sensory experiences. In past vision impairment tours, we have explored artworks in the Sculpture Garden through touch. But as any Texan knows, these surfaces can get pretty hot under the scorching Texas sun, making them uncomfortable to touch. This year, we were thrilled when our conservation team helped us identify several figurative sculptures inside the Museum that were suitable for touch. To help protect the sculptures, students and instructors wore thin gloves as we guided the students’ hands. We also explored the works of art through visual description, discussion, raised line drawings, scents, additional tactile objects, and by acting out poses. Take a peek at some of our favorite moments of this year’s tour! We are already looking forward to next summer! Click here for information about Art Beyond Sight programs or to request a tour for visitors who are blind or partially sighted. We’re super exsighted for Art Beyond Sight Awareness Month! 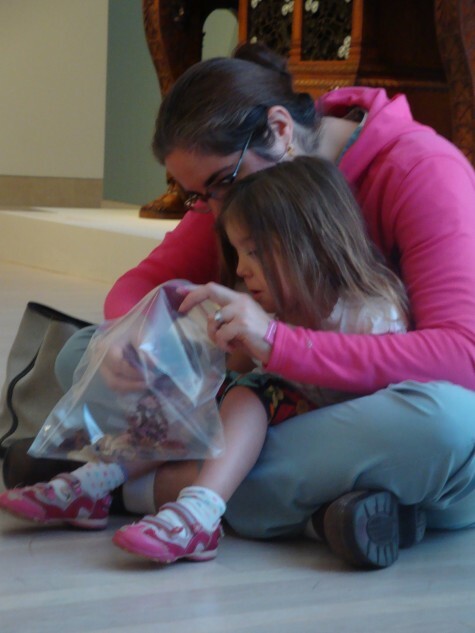 Check our schedule to find an art experience involving senses other than sight! The DMA, as well as other museums and cultural institutions across the country, have been tackling this question in the hopes of creating environments that are safe, open, and comfortable for a wide variety of people. Primarily, accessibility is thought of as a physical construct: a museum is deemed accessible if it holds no physical barriers to entry. Ramps, elevators and similar architectural structures are essential components for accessibility, providing individuals with and without mobility issues easy entry into any type of building. Removing physical boundaries is a key first step towards addressing the accessibility question. But then what? How does accessibility extend inside museum walls? Museums strive to ensure that their collections, programs, and services are accessible to all audiences, often by providing diverse educational programs that cater to visitors of varying abilities. 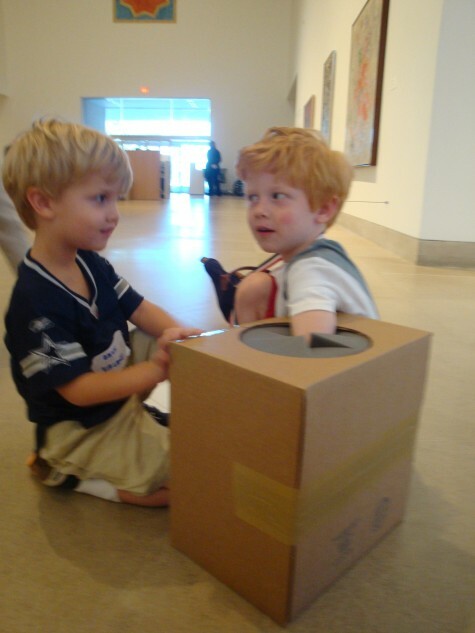 When we think about teaching at the DMA, we think about inclusive experiences that are open to everyone, regardless of a person’s ability. While making learning experiences at the DMA open and accessible to all is important, we also believe that designing individualized experiences for a range of needs is important too. And we hope these special programs raise the awareness that art is for everyone, though some visitors may need to work in different ways to see and enjoy it. Our Access Programs provide these individualized experiences for visitors with special needs. Interactive gallery experiences and hands-on art making opportunities are available for adults with developmental disabilities as part of our partnership with The Arc of Dallas, as well as for adults with dementia and their care partners during our Meaningful Moments monthly program. 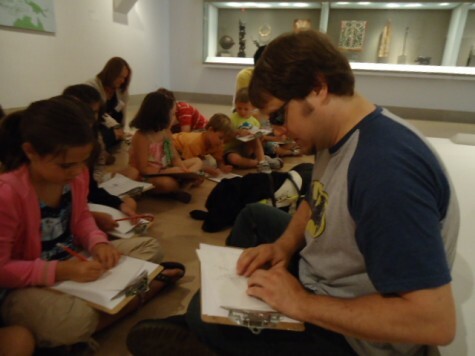 For families and visitors with autism spectrum disorders, we organize a specialized summer art camp for children as well as Autism Awareness Family Celebrations throughout the year. These multi-sensory programs and events involve tactile opportunities and art-making activities that enable visitors of varying abilities to discover and appreciate artists and their works of art. During the month of October, we participate in Art Beyond Sight Awareness Month and focus on helping visitors enjoy art using senses beyond eyesight. The DMA is an Art Beyond Sight Partner and is proud to have participated in programming for Art Beyond Sight Awareness Month each October since 2007. Composed of leading institutions in 35 states and 25 countries, Art Beyond Sight Awareness Month is an outreach effort dedicated to promoting art education for people with vision impairment and building an inclusive society with improved access for all. This year, we were excited to expand our offerings to include programs for adults. 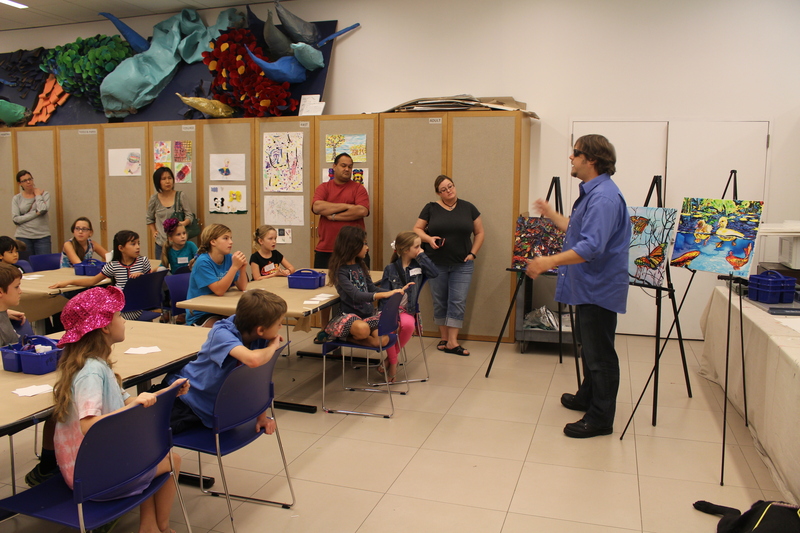 Artist John Bramblitt joined several ABS programs this month to talk about his process as a blind painter. Our October First Tuesday was focused on the senses and the Museum’s youngest visitors had the chance to immerse themselves in a sensory experience in Arturo’s Nest, our space for children under the age of four. John led Studio Creations in early October to kick-off a month of ABS-themed weekend art-making. He also led this month’s Meaningful Moments for visitors with Alzheimer’s disease and he will close our month of experiences by teaching our homeschool class. 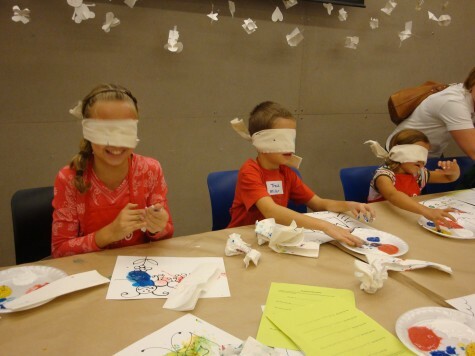 In our Arturo’s Art and Me class for children aged 3-5, kids got to paint in the dark to experience sightless painting and our Arc participants had the chance to wear blindfolds to paint with their fingers! In addition to these experiences, John led a public gallery talk for adults, during which he shared images of his artwork, talked about his process, and provided insights into his subject matter. And during Late Night last Friday, John teamed up with Stephen Lapthisophon in an artist’s lecture. Both artists have visual impairment, and both approach painting in a completely different way. John’s process is very detailed and planned out, with various techniques that he employs for raised lines. John uses raised lines to sketch the base of his drawing first – some of the lines are raised for only a short period of time while others remain raised to allow John to feel the contours of his drawing for a longer amount of time. After he drafts his lines, John adds many, many layers of paint. For Stephen on the other hand, art-making is a social art and isn’t highly technical. Both artists have varied creative inputs as well. Much of John’s artwork is representational and a reflection of an internalization of his sensory world, while Stephen’s artwork is more about the experience of his senses as he is creating (often with food and text) which could be a reflection of society and the associations of his materials. Each artist spoke a bit about his process and then each had the chance to sit down for a conversation together before taking questions from the audience. The artists had the chance to ask questions of one another and it was interesting to hear them contrast their processes and to get their takes on how other senses play a strong role in their own art. This program was an opportunity for visitors with visual impairment to meet and talk with John and Stephen. The lecture ended with a woman who has been blind for five years asking advice from the artists about her own art. Each artist gave her some ideas and encouragement before meeting with her after the lecture to continue the conversation. The Access Programs offered by the DMA are essential components in creating welcoming, accessible environments, but there is still more to be done. What other types of resources can and should be made available to visitors? Let us know what you think and be sure to check back in the future as we delve deeper into this matter. With October just a few days away, the DMA is gearing up to participate in Art Beyond Sight Awareness Month. Art Beyond Sight raises public awareness of ways that individuals who are blind or visually impaired can take part in art-related activities. 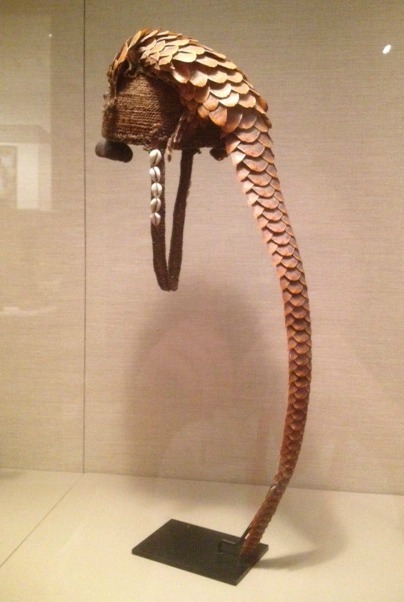 I imagine that this pangolin skin hat has an extremely scaly texture. Unlike the smoother scales of some animals, the pangolin’s skin seems to be much pricklier, almost like a pine cone! This Peruvian panel is covered in a thick mass of beautiful macaw feathers. I imagine that the lush feathers make this work of art extremely soft to the touch. This Indonesian jaraik was once hung outside a house as a protective figure. 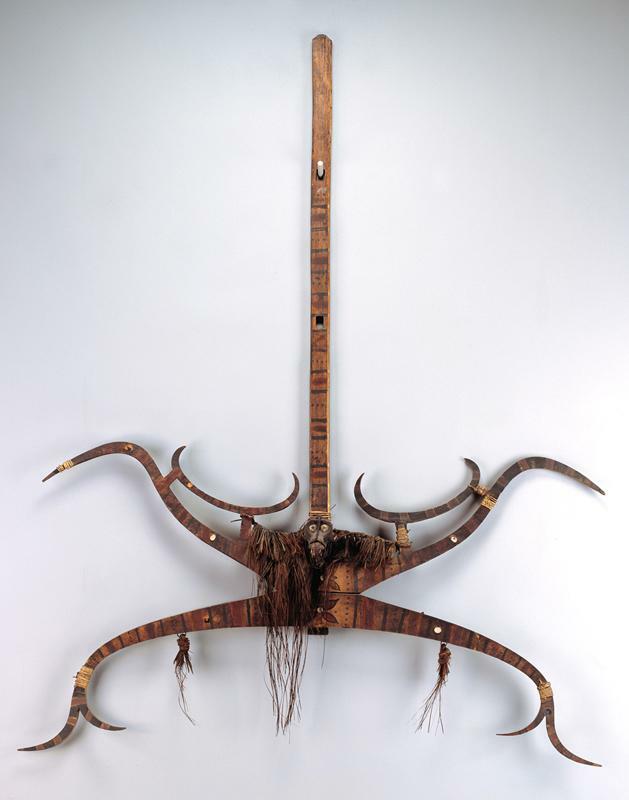 Made from wood and metal, the lower portion of the jaraik is pointed at the ends, like a misshapen pitchfork. Because of this, I imagine that it would be sharp to the touch. 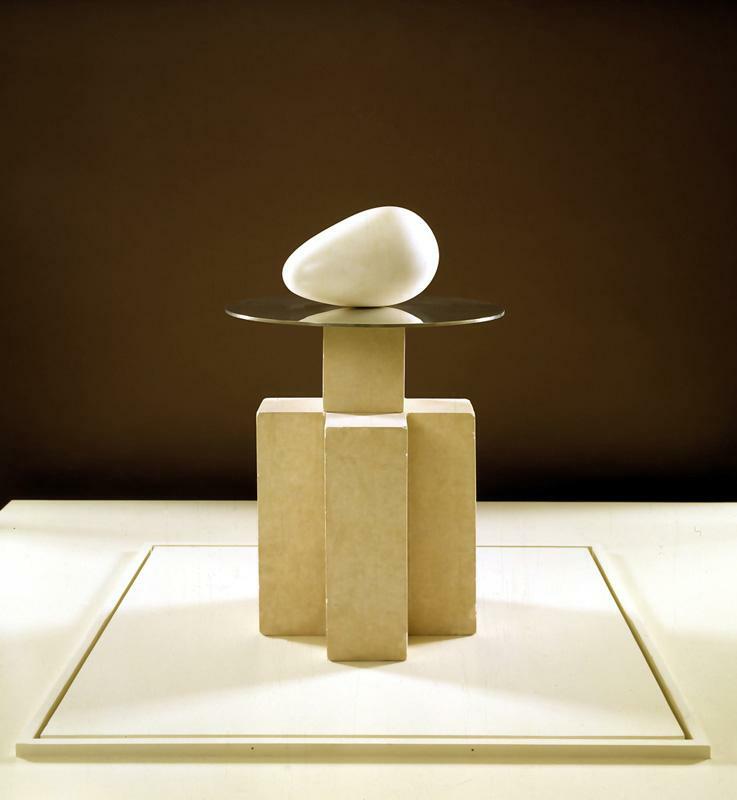 Brancusi’s sculpture, Beginning of the World, includes an egg-shaped form made from marble. I imagine that the marble figure has a smooth, sleek texture—much like the eggs that I purchase regularly at the grocery store! What other works of art can you find that are smooth, sharp, soft or scaly? Can you think of any other textures that are found in works of art here at the DMA? Tell us what your favorite textured works of art are and be sure to visit us during the month of October to take part in one of our many Art Beyond Sight activities! Protective figure (jaraik) in the form of an animal, 1900, Taileleu village, Indonesia, Dallas Museum of Art, The Eugene and Margaret McDermott Fund, Inc.
iMuseum 2.0 Late Night: Our September 21st Late Night is a not-to-miss night of new, experimental, and interactive programs. Among them are a Choose Your Own Adventure tour and your chance to text a work of art with your questions. New acquisitions on view. Current exhibition Variations on Theme: Contemporary Art 1950s-Present features more than a dozen of the Museum’s 2011 and 2012 new acquisitions. Check out online versions of the Museum’s Annual Reports and What’s New to keep up with our recent acquisitions, and then come see them at the Museum. Art-making in Posters of Paris. An art-making area in the upcoming Posters of Paris: Toulouse-Lautrec and His Contemporaries exhibition will provide visitors with everything they need to create their own artistic poster. Leave a copy of your creation at the Museum (to be posted on a wall in the exhibition), and take the real thing home for the fridge! Staff Art, Staff Selections. Visit in November to see an exhibition with artworks created by staff members. Also on view in the Center for Creative Connections is our Personal Point of View series where a Museum staffer is invited to select and respond to an artwork for the main gallery space. Book Talk. A book club-style event, Book Talk brings together Museum members (Sustainer level and above) for exhibition-inspired book discussions, exclusive lectures and tours, and author meet & greets. Klyde Warren Park Opening & Art Beyond Sight. On Saturday, October 27th and Sunday, October 28th, the DMA takes art-making activities into Klyde Warren Park for their grand opening. In honor of Art Beyond Sight Awareness month, we are focusing on experiencing art with senses other than vision. Sketch a nature scene, and then use scented paint to create your scene based on how it might smell. Karla Black: Concentrations 55: As part of Concentrations—a series of project-based solo exhibitions by emerging artists— artist Karla Black will transform our Hoffman galleries with a sculptural installation. Urban Armor: Programs for Teens & Tweens. As someone who discovered her love of art as a teenager, I’m pretty excited about the new suite of programs we offered are offer for a teen/tween audience. Urban Armor recently wrapped up a two-day graffiti project with a local artist and will kick off its Open Lab program this Sunday, August 26th, from 1:00-3:00pm. Arts & Letters Live presents Chris Cleave. On Tuesday, October 9th, the New York Times bestselling author of Little Bee will discuss his newest novel. Chris Cleave’s Gold is a tale of friendship between two female cyclists and how they traverse the shifting sands of ambition, loyalty, and love on the eve of their last Olympics. Thinking Creatively Workshops. I’m cheating a little with this one; it isn’t new to us, it’s just a great program. Starting September 13th, creativity expert Dr. Magdalena Grohman will lead a monthly Thursday evening Thinking Creatively workshop. The experience will begin with creative thinking exercises and conclude with a making activity that builds on ideas generated during the exercises. Workshops will be held on October 11th, November 8th, and December 6th, all from 6:30 p.m.-8:30 p.m. in the Center for Creative Connections. To get a taste of what you can expect, check out our Teaching for Creativity series; many featured activities are inspired by Dr. Grohman’s past workshops.